There is a difference between “science” and what we can call “scientism,” which is the notion that science can solve all problems. To a large extent, it is not science but rather how humanity has used science that has put us in our present difficulties. Because most people, in general, have no awareness of what science can and cannot do. So they misuse it, and they do not think about science in a more pluralistic way. So, okay, you’re going to develop a self-driving car? Good! But how will that car handle hard choices , like whether to prioritize the lives of its occupants or the lives of pedestrian bystanders? Is it going to just be the technologist from Google who decides? Let us hope not! Marcelo Gleiser is a Brazilian physicist and astronomer. 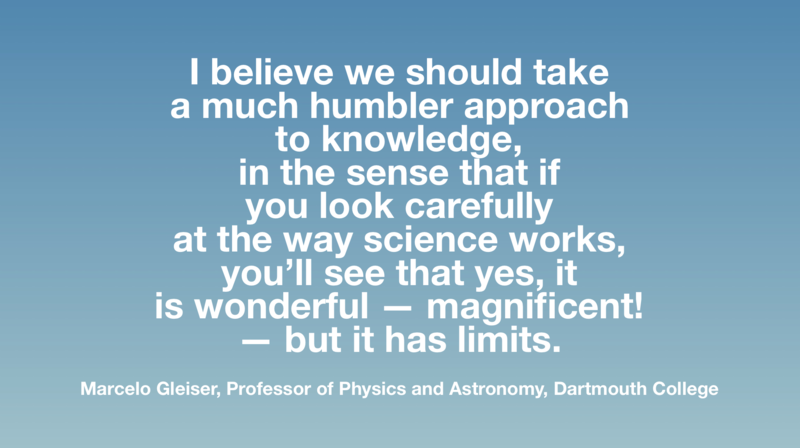 He is currently Professor of Physics and Astronomy at Dartmouth College.